A video documentary that could change everything you thought you knew about ancient, pre-historical times and how much ancient mythology we have carried into modern times and religious thinking. In this second episode of Symbols of an Alien Sky, David Talbott takes the viewer on an odyssey across the surface of Mars. Exploring feature after feature of the planet, he finds that only electric arcs could produce the observed patterns. The high resolution images reveal massive channels and gouges, great mounds, and crater chains, none finding an explanation in traditional geology, but all matching the scars from electric discharge experiments in the laboratory. planets moved close to the Earth. Though the present episode was designed to stand alone, for viewers of the first episode, the implications will come as no surprise. All lines of evidence converge on the story of a planet formerly immersed in electrical activity—activity that left unmistakable patterns on the planet’s surface. Today no body outside the Earth has been more fully surveyed than Mars. It’s surface features thus provide the best test of a new perspective on planetary history. 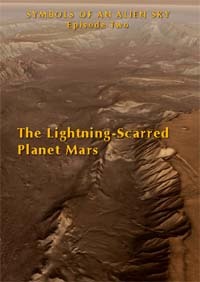 I just received and watched my DVD Symbols of an Alien Sky Episode Two - The Lightning-Scarred Planet Mars, and I'd like to say WOW!!! This is a MUST SEE not only for those who are following the development of EU, but it should also be shown to everyone who has 90 minutes up their sleeve. If ANYONE can watch it right through and still deny there may be some validity to electrical scarring of planets, they have their head buried deep in dogma. This is surely a groundbreaking presentation and should get as much viewing as people can give it. Grab a couple of copies, one to keep and one to loan to friends. It's that good.